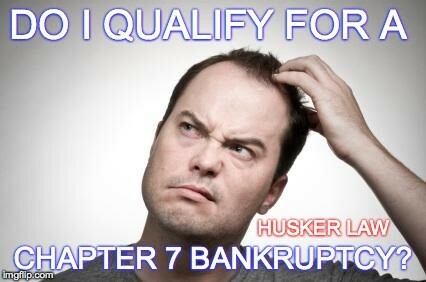 Since 2005, all consumer bankruptcy filers are subjected to what is called a means test. The results of the means test will determine whether you qualify for a Chapter 7 total liquidation bankruptcy or if your only choice is to file a Chapter 13 reorganization and repayment of a portion or all of your debt. In order to “pass” the means test, you must make less than the median income for the county that you live in. You can find out what the median income in your area is at the US Department of Justice’s website. As you can imagine, these amounts change so it’s important to use these as a guide and consult with your attorney if you have any questions. The income used to calculate the means test is your past six month’s gross income. This does not mean the past 180 days. This is the six months prior to the month you file your bankruptcy in. Whether you file August 1st or August 30th, the income you made between February 1st and July 30th will be used for the test. Because of this we will need to know what your income is for the past seven months, in addition to your past two year’s income, which we can get from your tax returns. The Bankruptcy Code requires debtors to file written proof of their income received within 60 days prior to the filing date. However, only the six months prior to filing is used to calculate the means test. Although you may pass the means test, the trustee may still object to you filing under Chapter 7 based on something called the “totality of the circumstances.” This is not extremely common, but it does happen more often when a person’s income seems to barely pass the means test. Now, do not be too concerned if you review the median income for your area and your income is above that amount until you have consulted with your attorney. There are certain expenses that you can use as deductions to figure your income; however, this can be a very complicated process and should be left to your attorney to figure out.